James Bond vs. Evil Black People. Guess who wins? 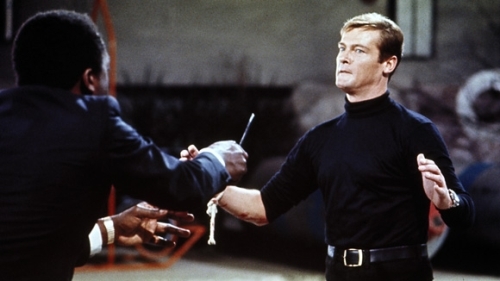 Roger Moore's first Bond film was purposely designed as a radical departure from Sean Connery in every way possible. Moore's 007 enjoys cigars instead of cigarettes, bourbon and water instead of vokda martinis, and uses a .44 Magnum instead of the Walther PPK. Bond investigates a heroin cartel run by Mr. Big and encounters voodoo, pimpmobiles and blatant blaxsploitation. Highlights include Bond visiting Harlem, running across crocodiles to escape a death trap, and a one man raid on a voodoo ritual, shooting Baron Sameda right in the head. Moore's misogeny to his Bond girls sees him tricking Solitaire, played by a gorgeous 22 year old Jane Seymour, so he could deflower her. That's still better than how Bond handles treacherous Bond Girl Rosie Carver. Yapphet Kotto as the evil Dr. Kanaga and his jive-talking alter ego in hilariously bad makeup Mr. Big is almost as much fun as his metal-handed henchman Tee Hee. Paul McCartney's "Live and Let Die" theme is a classic rock staple to this day.